Artco diamond pins offer a new dimension in precision grinding. They are today's answer for fast, efficient, reliable grinding of various even difficult materials...at low cost. Featuring hardened steel shanks with specially Electrogrip-bonded diamond particles, these precision grinding pins are ideal for use on jig and internal grinding machines as well as hand tools, consistently outperforming conventional pins. Fast stock removal is assured even on the hardest materials. 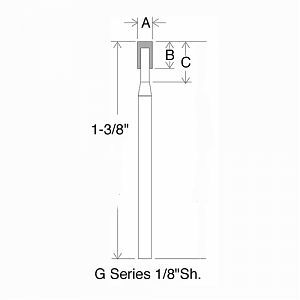 Available on 1/8"diameter shanks. For grits see chart below. Diameters 0.020" – 0.200" 60,000 to 120,000 rpm. Please select desired Diameter and Grit in options below.